The wall mount is not provided free of cost and is chargeable to the customer. Will it download any app? Best smart Tv in this budget. I think people who doesn't want to spen too much on a v should go with this Tv. It is very easy to use unlike other smart TVs. Good sound and picture quality. 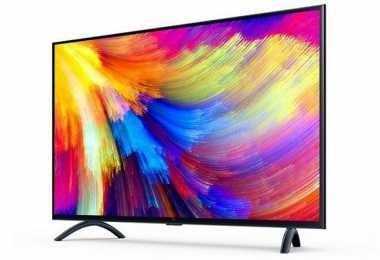 Latest price of Xiaomi Mi TV 4A L32M5-AI 32 Inch HD Ready Smart LED Television in India was fetched online from Flipkart, Amazon, Snapdeal, Shopclues and Tata Cliq. "Mi TV 4 And Mi TV 4A Second Flash Sale on March 16- Price, Offers, Specifications"
Looking for a smart TV to better your TV viewing experience? Xiaomi’s Smart LED television has to be the best choice for you. This budget TV is feature-packed and comes from one on the most trusted electronics brand in India, Xiaomi. If you’re buying your TV for the living room or hall, this 32-inch TV is a perfect size. Also, the LED display of the TV improves your viewing experience with brighter, higher quality images, and reduces eye stress and fatigue. The Xiaomi Mi TV 4A L32M5-AI 32 Inch HD Ready Smart LED Television’s price falls right in the budget, without any compromises on features. This smart TV comes with a 60 Hz refresh rate which means the videos and everything in motion will appear smoother and more natural. Better refresh rate ensures that there is reduced motion blur. And to further enhance this, the Xiaomi TV comes with amazing HD resolution of 1366 x 768 pixels, which are perfect for this screen size. This smart TV can do it all for you, streaming movies, downloading apps, surfing the net, etc. The WiFi connectivity lets you surf the net right there on the screen. And that’s not all; the TV also has 3 HDMI and 2 USB ports so you can connect other devices to your TV and stream content. Poor sound quality is the last thing you want for your TV, but with this TV unit, the sound quality is never going to be a concern. The Xiaomi Mi TV comes with two speakers, DTS surround audio system, and 20 W of sound output, for an impeccable TV viewing experience. The Xiaomi TV is built to perfection. It comes with an upgraded graphics engine for better impact. Have features like optimised anti-aliasing, reduced ringing effect, dynamic noise cancellations, and improved brightness and contrast. The TV also has 1GB RAM with 8 GB internal storage with massive content library and runs on 64-bit quad-core processor.